Amaranth is a whole grain packed with vitamins and nutrients, too hard to pass up. Plus the beauty of this ancient grain is that it’s gluten free. 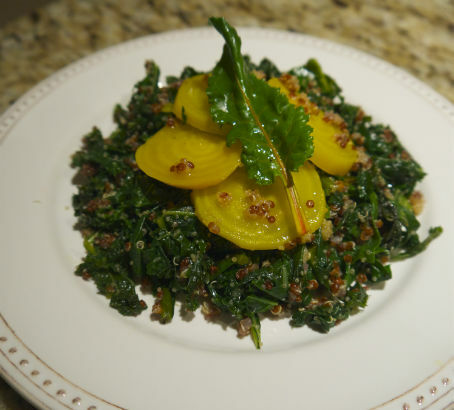 Click this link: to read more about amaranth by our Seasonal Chef. This very healthy mixed grain and green salad is easy to assemble and tastes even better the next day! Snip the beets from the greens and give them a rinse to remove the dirt. Place in a small pot of cold water with a half teaspoon each of salt and sugar. Bring to a boil, lower the heat and lively simmer for about 20-25 minutes or until knife inserted slides easily out. While the beets cook put 2 cups of hot water into two separate pots each with a teaspoon of salt and bring to a boil. Drop the quinoa in one and the amaranth in the other. Cook both at a lively simmer for 15 minutes. Remove from heat and cover for 5 minutes to allow the grains to steam. (This is my special trick, and helps them to not overcook. While the pots are all boiling roll the kale and beet greens like a fat cigar and slice them in about 1/4" ribbons. You will have about 8-10 loosely packed cups. Don't worry, they cook down! In a large saute pan heat 1/4 cup olive oil with the garlic. Once the garlic starts to sizzle add the greens along with 1/2 teaspoon of salt and pepper and sauté for about 2-5 minutes. Take care to not burn the greens; you want them to wilt slightly, but stay a little firm and chewy. Remove from heat and set aside. In a small jar add the orange juice and sherry vinegar, it should be 1/3 cup, 1/4 cup of olive oil and 1/4 teaspoon each of salt and pepper. Shake vigorously to blend and set aside. When the grains are cooked mix them together using a fork, add 1/2 to the cooked greens tossing gently to incorporate them all around the greens. Dress the greens with a little of the dressing. Take the remaining amaranth-quinoa mix and save for another dish. To plate simply place the greens down first and then the beets on top. Drizzle with a little dressing and serve. Previous ArticlePoll: Should babies be allowed in fancy restaurants?